Nureva Inc. a collaboration-solutions company, will debut the Nureva Wall WM408i system at ISE in Amsterdam next week. The new WM408i combines a high-definition ultra-short-throw projector with a projected capacitive multitouch surface to create an expansive interactive working space that supports a wide range of collaborative processes and activities. The ‘tightly integrated’ system delivers an advanced multitouch experience in nearly any space, regardless of the wall type or lighting. The new system also incorporates an automated start-up experience through presence detection. Walls from 7.5′ (2.29 m) to 30′ (9.14 m) wide can be installed in side-by-side or corner configurations to create workspaces tailored to individual customer needs. 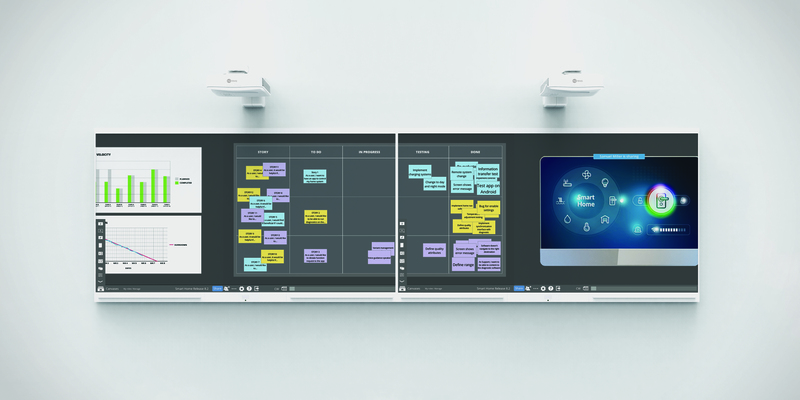 The Nureva Wall is optimized for use with Span visual collaboration software, but can also be used with any Windows OS application. The Nureva Wall will be available for pre-order from next month through its global network of dealers and distributors, and will begin shipping in June. The MSRP in the United States is $8,999. Prices in other countries will vary. Up to four walls can be combined to create a 30′ (9.14 m) wide working space, with the most common configurations being two (15′ or 4.57 m) or three (22.5′ or 6.86 m) systems. Multiple walls can be installed side-by-side or in a corner.